So, How do you currently monitor your logs and events, including network, servers, databases, applications, your router, firewall or Windows servers? Obviously, If you have thousands of machines on your network.. It will become more complicated. Due to the massive boom in the cyber attacks and security breaches that result in financial losses and damages the goodwill of the reputed corporations, the demand for SIEM tools is increasing continuously among the IT security professionals and system administrators. Security Information & Event Management (SIEM) is the best solution, that has evolved over the years to become one of the most trusted and reliable solutions for log management, security, and compliance. SIEM systems provide a holistic view of an organization’s Information technology (IT) Security by collecting logs and other security-related documentation for analysis. But SIEM systems are typically expensive to deploy and complex to operate and manage. So, here SolarWinds Log & Event Manager (LEM) meets your expectations and provides you all of the essential features required of SIEM. LEM is deployed as a virtual appliance, and also supports Hyper-V that makes it easy to get up-and-run quickly. It boosts the capabilities of organizations of any size to improve their overall security posture, detects and remediate security threats, and achieve compliance objectives. Real Time threat Detection: SolarWinds LEM is a full-functioned and matured Security & Information Event Management (SIEM) solution that delivers powerful log management capabilities in a highly affordable and easy-to-deploy virtual appliance, offered by an excellent and well-respected company. It not only centralizes and collects logs, but it also helps to correlate important events, provides advanced searching features, and even takes automatic action against threats, all in real-time! All logs and events can be collected in one central location from multiple sites via virtual LEM appliances, even across geographically remote data centers and branch offices. 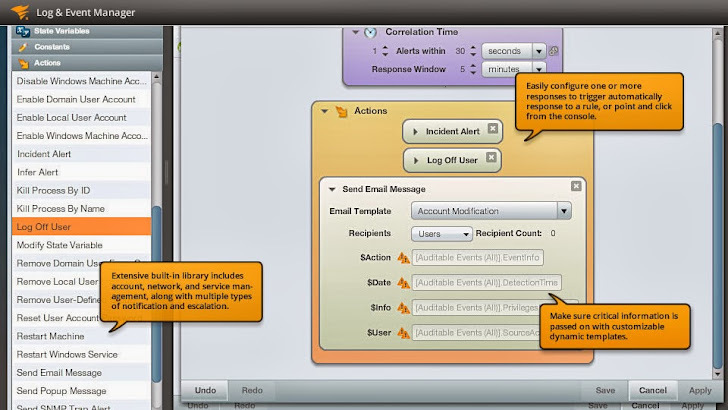 Active Responses for automated remediation: Besides this, SolarWinds Log & Event Manager allows you to automate incident response to counter real-time threats and take preventative action. Remediation via Active Response, including the ability to block IP address, disable networking, and account membership and enablement, shutdown system, and more. An administrator could collect malware information from installed Antivirus products, and once a potential intrusion is detected, SolarWinds' LEM could automatically shut off Internet access to the infected machine until a technician has addressed the issue. It supports for hundreds of out-of-the-box critical security devices and applications including IDS/IPS, anti-virus software. Active Response mechanisms allow organizations to immediately and automatically remediate all events that are out of line with policy or expected behavior, such as unauthorized access, unwanted configuration changes or abnormal traffic patterns that could indicate a compromise. Protection and monitoring down to the endpoint: If your organization is very concerned about the large-scale data loss from USB devices. SolarWinds’ LEM extends the security protections beyond network devices to USB storage systems that users connect to the network. 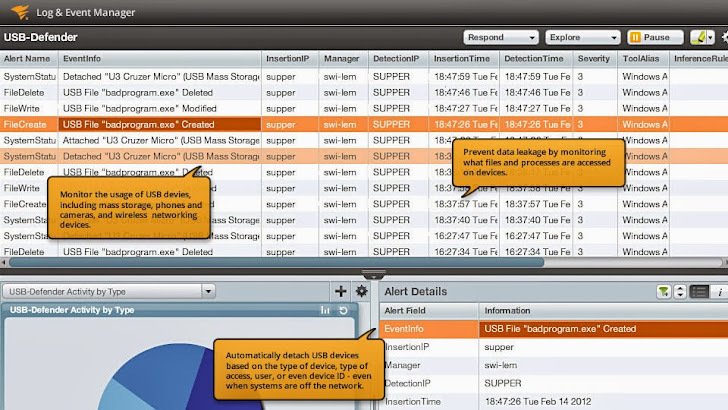 LEM has USB Defender and built-in technology to monitor usage of USB devices (even when disconnected from the corporate network). It can identify unauthorized access and copying/theft of sensitive files, and enable automatic ejection of USB devices to assure that your company's secrets are never stolen by simple external devices. 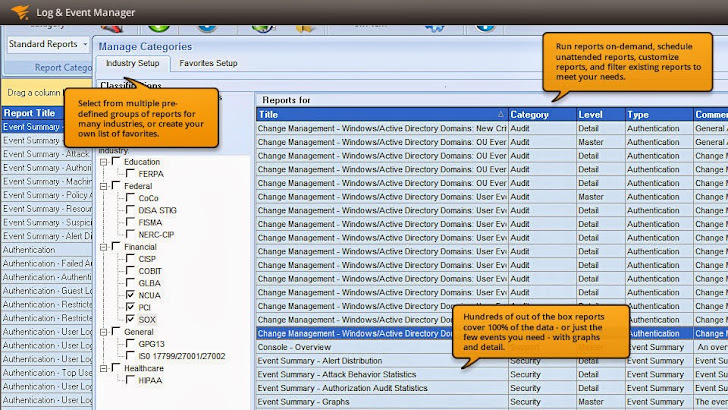 Reporting: SolarWinds has included a powerful reporting engine with Log and Event Manager, with 300+ audit-proven built-in compliance reports for different industry regulations including GPG13, ISO, PCI, GLBA, SOX, NCUA, HIPAA, DISA STIG, FISMA, NERC-CIP, and others. LEM is a powerful tool for event forensic analysis that provides advanced log data visualization tools including word clouds, tree maps, bubble charts, and histograms. If you are interested, you can learn more about SolarWinds Log & Event Manager from its official website and Demo is also available here.